force for Chicago Julian's city and state title hopes. Whoever said point guards aren’t made they are born, well, Brandon Ewing has beef with you. 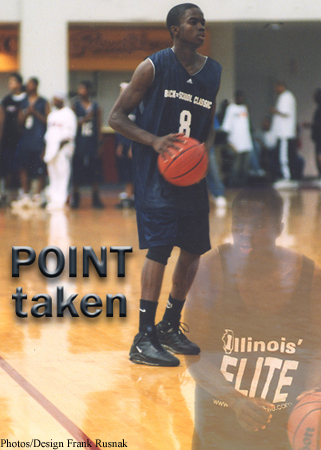 Chicago Julian’s 6’2” senior, Ewing is a calming influence and energy-producing idealistic point guard – now. "I figured if he didn't grow anymore he'd have to be a point guard." When the Wyoming recruit began his prep career he certainly wasn’t a lead guard, with his focus on scoring and not distributing. The verbose Ewing began his prep career a bit shy and reserved. Coach Loren Jackson had one of the city’s finest teams and leading the way was eventual McDonald’s All-American point guard Sean Dockery. The same influence that helped quiet Ewing made him elevate his vocal cords more in his sophomore campaign. Now a junior at Duke and the team’s starting point guard, Dockery sat down the then-freshman Ewing and told him about being a leader and the intricacies of the point guard position. After Dockery’s departure to Durham, North Carolina, Ewing was left by himself with the Jaguars. Ewing tried to revert back to his more natural-feeling position of shooting guard, but Jackson helped make him realize his future was as a lead guard. His balance is showing with averages of 23 points, six assists and six steals. All of that with a 5-1 record, with the Jaguars only loss coming to Von Steuben in the championship game of the Blue Cross Blue Shield Tip-off Classic. This year’s version of the Jaguars is the best Ewing has been on in his four seasons, he said. As the season continues, Ewing has taken the responsibility of tutoring Julian’s youngest star, just as he was by Dockery. When Ewing is done with his prep career he will have big shoes to fill at Wyoming. A senior at Wyoming, Chicago native Jason Straight “will go down as one of the finest players to ever wear a Wyoming uniform,” proclaims the Cowboys’ official Web site. If you ask Jackson, it shouldn’t be a problem for Ewing to hold his own on the next level. “I think Brandon is one of the best players in the state,” he said. “He’s been overlooked a lot because as a 6’1” guard he doesn’t have tremendous blow-by. But the thing is he knows how to use his body, he knows how to get to the rim, he knows how to protect the ball. And he’s a winner. He’s won. High School Elite, All rights reserved.